Mixed-use development would restore Federal-era building to tenement period, adaptively repurpose for use as part of a new public school. On February 16, 2016, Landmarks considered an application for alterations to, and new construction above, the individually landmarked Robert and Anne Dickey House at 67 Greenwich Street in Lower Manhattan. The work would be part of a mixed-use development by Trinity Place Holdings that would see the creation of a tower at the adjoining lot to the north of the landmark. The development would include retail space, a public school at the lower levels, and residential units in the upper floors. The Dickey House would be integrated with the new tower and serve as part of the school. The landmark was originally built as a townhouse in 1810, and is a rare survivor of the Federal period in Lower Manhattan. The building was converted to a tenement in the mid-19th century as the area became less desirable for upper-class residents. A rear addition was built in 1922. Both the main building and the rear addition have been repeatedly and substantially altered in the intervening decades. The building does retain its bowed bay at the rear facade. Consultant Elise Quasebarth, of Higgins, Quasebarth and Partners, testified that the Dickey House was significantly deteriorated and retained little Federal-period fabric or details beyond splayed lintels and some original brownstone and brick. Quasebarth also noted that the building’s south wall was rebuilt in 2013. Architect Dan Kaplan, Senior Partner at the firm FXFowle, presented the proposed work. The rear addition would be demolished and a new entrance plaza created where it stood. The rear facade’s projecting bow would be rebuilt, and new signage pertaining to the school would be installed. Fire escapes and chimneys at the roof would be removed, and a fence installed behind the cornice to make for a play area on the roof. The new fencing would not visible from any street vantages. The House’s windows would be replaced to match historic conditions, new shutters installed, and the building would be repainted in hues based on analysis of existing remnants, with painted brownstone trim. The interior of the house, which is not under Landmark’s purview, would be extensively renovated, with floor plates removed, and new concrete ones installed at different planes to align with those of the tower’s lower stories, with which it would be integrated. The new tower to the north of the Dickey House would possess three cantilevers extending above the landmark: a one-foot cantilever 49 feet above the house; a cantilever extending three feet beyond that at 83 feet; and another cantilever projecting eight feet further at 183 feet above the House’s roof. Beyond the extent that the new tower would penetrate the landmarked air space, it would be completely as-of-right. Josh Nachowitz of the Downtown Alliance testified in favor of the proposal, arguing that the planned development would “contribute to the vibrancy” of the neighborhood. The Historic Districts Council’s Kelly Carroll applauded the restoration and adaptive reuse, but suggested that the applicants also recreate a historic stoop. Quasebarth responded to questions as to why the team had chosen to restore the building’s facade to its tenement era rather than original Federal period by stating that there was no visual documentation of the building’s early history, and to emulate the Federal style would be “re-creation, not restoration.” Kaplan said the demolition and reconstruction of the north wall was necessary to meet School Construction Authority fire codes and to support the new floor plates. Landmarks Chair Meenakshi Srinivasan found the proposal to be “a good thing for Lower Manhattan,” and that the restoration and reuse of the “very forlorn” Dickey House was commendable. She determined the cantilevered portions of the tower to be acceptably distant from the roof of the landmark, and did not significantly impact the perception of the historic house. Srinivasan noted that the commission had approved cantilevers over individual landmarks in the past. 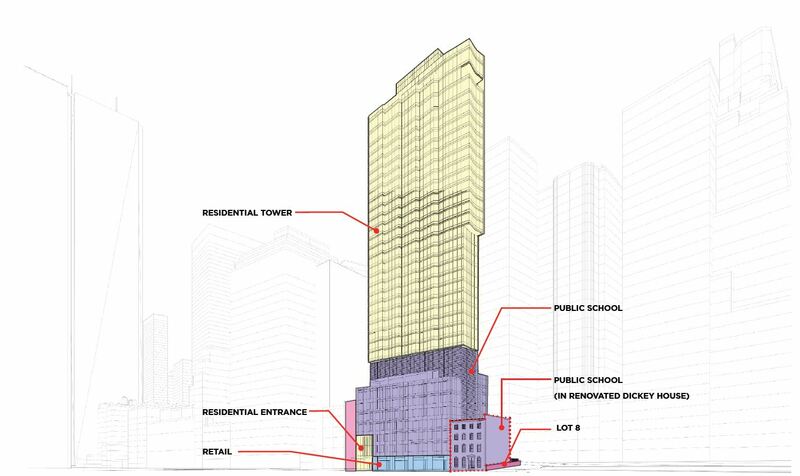 Commissioner Fred Bland found the proposal generally approvable, but observed that the developers could push back the entire south facade of the new tower to retain the design without imposing in the space over the landmark. Bland added that they could recoup the lost floor area by making the tower taller. Commissioners Michael Goldblum and Michael Devonshire endorsed Bland’s suggestion, with Devonshire further recommending that a sign pylon in the entrance plaza be eliminated and the paint color be reconsidered. Commissioner Adi Shamir-Baron opined that the tower’s south facade could be redesigned so that the projection would read more as ornament than cantilevers. Chair Srinivasan asked the applicants to rethink whether they “absolutely need” the cantilevers, and to consult with Landmarks staff on the colors and details. She asked them to return to Landmarks at a later date with additional information and possible alternatives. LPC: 67 Greenwich Street, Manhattan (18-0952) (Feb. 16, 2016) (Architects: FXFowle Architects).